From the Times’s security cameras you can see the quickly arriving squad car, the Mayor’s SUV but barely the crash victim. The LAPD, Mayor’s Office and to some extent the media are downplaying the significance of yesterday’s afternoon car crash in Downtown Los Angeles involving the Mayor’s SUV. 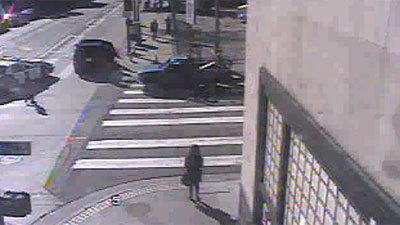 Driven by an LAPD officer, the vehicle was driven into a pedestrian inside of a crosswalk causing her hospitalization. The the officer and his passengers were traveling east on 2nd Street towards City Hall when the crash occurred at Spring Street. A video of the crash was taken by L.A. Times security cameras, but the resolution is so grainy and the actual collision occurs off-screen. 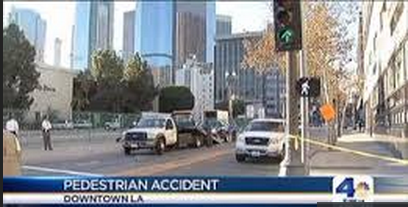 The LAPD dismisses the crash as “minor.” And with reports already streaming in that the woman was “crossing against the signal” it is possible that the city will use this crash as justification for its widely panned pedestrian stings. Police Cmdr. Andrew Smith said the woman appeared to be crossing 2nd against the light when the accident occurred, but further investigation was needed. The LAPD biasses its own investigation by stating the “probable” cause of the crash without all of the needed information. We don’t know if the officer had a chance to speak with the victim in the crash or what further investigation was needed. We do know that the officer assigned blame to the largest media outlet in the city before the investigation was completed. The Times video showed only part of the scene because of the camera’s angle. It appears to show the pedestrian was struck as Garcetti’s SUV was passing a pickup truck stopped in the crosswalk. …that at best the LAPD driver was driving unsafely. Even if Smith is correct that the woman was crossing against the signal, and if that is true the woman would have had to start crossing the street AFTER the signal was already a “Don’t Walk” for this to be true, than the LAPD driver wasn’t following basic driver’s safety. If you see a car stopped at a crossing, you need to be certain that there is not a person crossing the street before proceeding. There’s a reason that pickup truck was stopped, and a trained driver should be on the lookout for why. By then, Smith said, the mayor’s LAPD driver had already checked on the woman’s condition, told the other officers at the scene what had happened, and determined paramedics were on the way. He had also told the officer that he needed to take Garcetti to City Hall, but that the mayor and two other witnesses who were in the car would be available for interviews once investigators were ready, Smith said. I haven’t been involved in a car crash in a long time, but I’m pretty sure that the person driving a vehicle involved in a crash isn’t usually the one that determines when he/she gets to leave the scene and when witnesses are interviewed. Giving special privilege to the driver because he’s another police officer, or because of who his passenger is, is one of the surest signs that an investigation isn’t on the level. “This, by all appearances, was a relatively minor collision, except that the mayor’s driver was involved,” Smith said. 1) If the woman was crossing against the signal, why? Is the signal not long enough for a safe crossing of all pedestrians? Was a light out? Was there some other sort of confusion? 2) The pickup truck the Mayor’s SUV passed was already in the crosswalk. Was it there during the crossing signal? Did it disrupt the pedestrian flow causing some people to scamper against the signal to get across the street? Was the driver ticketed for parking his car in a crosswalk? That last question is rhetorical, people park their cars in crosswalks during red signals in L.A. with impunity. 3) Was the Mayor’s SUV stopped at the signal and if so was it the first car? If so, the driver likely failed the most basic rule of driving which is “look both ways before proceeding” and should be ticketed with no questions asked even if the signal was red as a stop sign and audio was screaming “look out unnamed female pedestrian!” If the vehicle was moving before entering the crosswalk, was the driver going at too high of a rate of speed to stop properly? While there are more things we don’t know about the crash than things we do, at least the city can’t blame glare of the bright green spring street bike lanes as a cause of the crash. As more news breaks on the story and investigation, Streetsblog will continue to cover. hard to make out a form, but people seem to be kneeling there). the person who was hit was exiting the truck that was parked in the crosswalk. but that’s what appears to happen to me. 1. The walk signal plenty long — far longer than ADA requires. When I was there last night to look at the scene, the white “Walk” signal is at least 10 seconds, and then an 8 second flashing red countdown. 2. From the video, its pretty clear the truck is waiting for pedestrians to clear Spring Street in order to turn on a green — and is pulled to the right, as required by law. The truck has the right to enter the crosswalk, as its a green light — [quibble: a driver waiting to turn is not ‘parked’ in a crosswalk if the engine is on and its in drive…]. Since the woman is not seen in the video walking along Spring Street, I think its fair to say the truck did not disrupt her specifically, and since the light was green on 2nd, it was not disrupting the pedestrian flow at all. And, you allude to passing vehicles stopped for pedestrians (VC 21951) — but that only applies when passing through a crosswalk that someone is stopped at. Had the mayor’s car turned right while overtaking that truck, yes… but not the same thing to going straight while another car is turning right on a green. Regarding problem 1 — …”that at best the LAPD driver was driving unsafely.” In the video you can clearly see pedestrians and vehicles traveling along 2nd for several seconds prior to the collision — the same direction that the mayors vehicle was traveling. Since the collision occurred off camera, I’m more inclined to believe that the driver was merely pulling over after the accident rather than going around the pick-up to make a right turn — especially since City Hall is to the LEFT. I agree it was improper to comment so early, but let’s not start assigning blame in retaliation without some level of supporting facts. Regarding problem 2 — A patrol car clearly pulled over along with the mayors vehicle, don’t assume that the officer driving the mayor was controlling the investigation when there clearly were other officers present. Pending the investigation, it could have very well been the other officer that cleared the driver to leave the scene — bad call, but a very plausible scenario. I agree that we shouldn’t immediately “blame the victim”, but how is immediately blaming the driver any better? I don’t like the comment from the LAPD, but many of your questions/speculations are a stretch. Yes. There is some speculation, but the speculation is caused by an investigation and public statements that were not appropriate. Unless we’re dealing with a maniac who jumped in front of a moving vehicle, then some of the blame has to go on the driver. Remember, just because “some of the blame” goes to the driver doesn’t mean that he or she necessarily broke a law. 1) What you say is completely possible. But if the LAPD can drop a definitive sounding statement that gets echoed by NBC, CBS and other news outlets before their investigation is done; then providing some other potential narratives is certainly fair game. 2) I wasn’t at any of the press briefings, so I’m reliant on what the Times and others are reporting. If I misunderstood their writing and the lead investigator told the driver to finish his drive and come back instead of the other way around, then I apologize. We don’t actually know when the crash took place on the video, in large part do to the grainy footage. My guess is you’re probably correct in your guess in #’s 2 and 3, but a lot of this article is asking questions that seem to have been mostly left unasked, in large part because most reporters are repeating the victim blaming claim of the LAPD. Just because the LAPD issued a statement prematurely does not mean you should too. Take the higher road. Since we’re postulating here, from my view of the video, it appears no one exited the pickup truck prior to the crash. Instead it appears the pedestrian was hit in the roadway just behind and to the left of that pickup. Without further information of video footage, it’s difficult to determine more, but I think most (all?) LAPD cruisers have dash cams. Perhaps the cruiser that arrived almost immediately got some additional footage. Surely the SUV has a dashboard camera? It is a public record. Time for a Freedom of Information request! I honestly do not understand why this sort of situation is not always the fault of the driver, as it is in most countries. I still don’t get why very smart, very sensible people still believe that it is somehow up to a pedestrian to protect the operator of very large, very fast, very heavy vehicle, from hitting them. I think a useful way to think about it is that blame doesn’t have to add up to exactly 100%. Someone can be completely at fault for something, even if someone else also has some blame to share through their own independent negligence. I would agree that most often it is (or should be) the fault of the driver in ped vs vehicle accidents. However, by all appearances so far, the pedestrian stepped into the path of a moving vehicle against the signal. It’s hard to understand assigning blame on the driver is such a situation. I live adjacent to this intersection, and while I cannot speak to the specific incident here (other that to say the way the crash is being associated with the Mayor is a bit silly and sensationalistic), I can speak to the constant pedestrian endangerment that happens there. Specifically, cars coming down 2nd St. making right or left turns onto Spring St. tend to be largely oblivious to pedestrians crossing Spring St. As soon as the light turns green, cars waiting to turn right will tend do so, even when there’s a large group of pedestrians waiting to cross. Cars turning left will also do so completely oblivious to pedestrians in the crosswalk. On top of that, essentially every car turning right onto Spring St. turns directly into the buffered, green-striped bike lane, rather than into the traffic lane, and many of those cars also prematurely cross over the solid white lines of the 2nd St. bike lane in preparation for their turns. LAPD should, as an act of good faith, set up an extended traffic sting at this intersection and ticket every moving violation they see (including those committed by LAPD personnel). That would send a clear message that they take pedestrian safety as seriously as they claim, and that they acknowledge that accidents involving pedestrians are not the sole responsibility of those pedestrians. This location is immediately adjacent to LAPD headquarters, so it’s an appropriate place to start making that message clear. They could be ticketing pedestrian violations as well, as long as they are attempting to ticket every equivalent moving violation. If they are going to ticket pedestrians entering a crosswalk right after the hand starts flashing, they better also be ticketing every single car that enters the crosswalk with pedestrians in or about to enter it, and every car that crosses illegally into the bike lanes. The number of violations that occur there – including frequent red-light running and wrong way turns – would keep them busy for some time. A successful pedestrian safety sting could then move from intersection to intersection around the parts of downtown with the heaviest pedestrian and bike traffic. If LAPD wants to show that they take pedestrian safety seriously, that’s an obvious way to do it, regardless of the details of this specific incident and investigation. Or the crosswalk could be paved to meet the height of the sidewalk and the cars would have to go over what amounts to a large speed hump to proceed on Spring. That mentality assumes that pedestrian injuries and deaths are inevitable because car drivers are entitled to move at a speed in which there is no room for error. What if this was a young child who broke loose from a parent momentarily? A dog that ran out from the LAPD dog park across the street? A person with a hearing or visual disability? Is it too much to ask that CVC 22350 “Basic Speed Law” be applied in a way in which car drivers are responsible for the result of the speed with which they are traveling? Is it really “prudent” to drive a car in an urban setting at speeds so fast that a driver will not be able to avoid maiming or killing pedestrians who are present? I’m all for traffic calming measures and streetscape improvements, and hope that DOT starts to consider this sort of thing (though that particular treatment looks perhaps more appropriate for a suburban environment than on a major downtown street). I’d like to see a pedestrian lead intervals, and maybe some bulbouts. Adding real protection to the bike lanes would be nice too. In the end though, LAPD has little to do with making such improvements, and been demonstrating problematic attitudes toward “pedestrian safety” lately. Enforcing existing laws intended to protect pedestrians would be a good way to demonstrate that they recognize the issues, and it is something they could start doing immediately. You’re moving the conversation into a completely different discussion. The above comments are regarding whether the driver who (as far as we currently know) was operating within the existing speed limit should shoulder any blame if the pedestrian attempted to cross the street against the traffic signal. The posted speed limit is different from CVC 22350, which requires that one does not drive “at a speed which endangers the safety of persons or property.” This driver clearly hit and injured someone, and I am agreeing with ywhyknot in that the driver could be found at fault for not operating their vehicle in a way that allowed them to avoid pedestrians in a pedestrian district, regardless of a pedestrian’s actions. LADOT has painted “guidance lane striping” (I don’t know the official term) at a good number of intersections to assist turning vehicles so that they don’t turn into a bike lane. (You can see this at several points along the new 7th St bike lane.) At a minimum, it seems prudent for LADOT to do no less with this problem intersection. His speed would not have endangered anyone had the pedestrian followed the traffic signal. And here we have the crux of your argument. It has to be the drivers fault because there is absolutely nothing the pedestrian could do that would make it theirs. Why is the pedestrian absolved of all accountability for their own actions? Are you saying that the safety and protection of a pedestrian is entirely on motorists, that pedestrians have no responsibility for operating within their environment in a responsible and predictable manner? As long as one takes the position that if a pedestrian makes a mistake, they may be killed and a motor vehicle driver absolved of fault for impacting them, people will continue to be maimed and killed on our streets. People make mistakes, and a driver should be responsible for what damage can be done with their car. Clearly in this case, the driver was not operating in a prudent enough manner to avoid serious injury to someone. Whether the driver was distracted, making an unsafe lane change, or driving at an unsafe speed considering the urban context and visibility; I see plenty of reasons that a car driver can and should be held accountable, whether or not a pedestrian made a mistake or not. You are literally arguing that if I walk in front of a car and it hits me it’s the drivers fault for not avoiding me… wow. The accident occurred off camera. Unless you somehow have knowledge of the accident, you are assuming that the driver was distracted/reckless and that the pedestrian was not. The woman very well could have stepped out from behind a parked car and the mayors vehicle hit her mere seconds later. I am literally arguing that the way to stop people from getting hurt and killed on our streets is not to assume that no pedestrian will ever make a mistake, but to hold drivers responsible for not hitting pedestrians. Unless you think car drivers are entitled to kill people, it isn’t too much to ask that drivers in an urban area do so at a speed and with necessary caution that allows them to avoid a pedestrian that comes into the path of their vehicle, particularly in a crosswalk. And yes, there are some members of the city’s homeless who do dart in front of cars in certain areas of Downtown, and no I don’t think that car drivers should have the right to injure or kill those pedestrians with impunity either. You are again laying all responsibility at the feet of motorists. Pedestrians and motorists EACH have a responsibility for the safety of themselves and others when traveling in the public domain. We are blaming the driver because the driver was in control of more than 2 tons of potentially lethal machinery, because motor vehicle violence kills more people in the US that gun violence and we lead the world in gun violence. More than 35K people died in 2012 from motor vehicle violence with about 5K walking or riding bicycles, and another 2 million were injured. That’s why people that know these things immediately jump on the driver in a pedestrian or cyclist wreck with a motor vehicle. Do you also expect that civilians have a responsibility to protect themselves from random gunfire rather than require gun owners to not shoot except where there is a safe background to trap stray bullets? Because stray bullets are much less fatal than wandering cars, according to the CDC study released in 2004 bullets kill 9% of the time they hit somebody, where a NHTSA study from 1999 found cars kill 50% of the pedestrians and cyclists they hit at 30 MPH. Raise that speed to 40 MPH (a normal non-rush hour speed) and 85% of people not driving cars are dead. Those are not even close to comparable, however I will entertain your line of logic. Using your analogy, this incident would be akin to someone walking across the lanes of a shooting range when live fire has been authorized rather than waiting for an ‘all clear’ before starting. This woman had a responsibility to follow the traffic signal. and, a friend of then Mayor Antonio Villaraigosa and now Mayor Eric Garcetti, IGNORED a January 2012 MOLD REPORT DOCUMENTATION OF HIGH LEVELS OF TOXIC MOLD SPORES in a tenant’s apartment, then, illegally, retaliated forcing that approximately 30-year tenant and her family out of the apartment. The building, supposedly under rent control, appears to have become a problem after REV. PHILIP J. LANCE’S arrival. The offices of the LOS ANGELES CITY COUNCIL (Herb Wesson, etc. ), Los Angeles County Board of Supervisors (Mark Ridley-Thomas, etc.) were contacted about the LOS ANGELES COUNTY DEPARTMENT OF PUBLIC HEALTH and LOS ANGELES HOUSING DEPARTMENT’s failure to act. Yet, even though the health, safety, and lives of an eleven-unit building full of tenants may be at risk, by way of the well-established “TOXIC BLACK MOLD” as well as other toxic molds, it was TO NO AVAIL. To this date nothing appears to have been done to help resolve the problem. REV. PHILIP J. LANCE appears to have sold the building in September/October 2013, THEREBY DUMPING THAT BUILDING FULL OF TENANTS. and/or, was “KICKED OUT” OF THE LOS ANGELES DIOCESE IN THE LATE 1980s OR EARLY 1990s, under what appears to be questionable circumstances, is the founder and/or operator of eight schools (K-12) and one preschool. This is the kind of person then City Council President and City Council member, now Mayor Eric Garcetti, Mayor Antonio Villaraigosa, LAUSD, etc., have helped give access to thousands and thousands of children, in schools which are linked to medical and mental health facilities (facilities and connections he has lead that 30-year tenant to believe he has NO PROBLEM ABUSING).